We moved to Helmsley in 1989 to run the best bed and breakfast and it was probably the best move we ever made. But enough of us what about the Town? Well, Helmsley derived its name from ”a woodland clearing of a man called Helm” and is first recorded in 1086 as Elmslac. 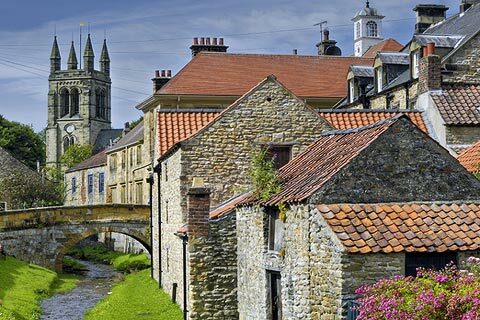 The history of Helmsley is best told by its surrounding architecture. Castles, Abbeys, Churches, a Mansion, Town Hall and Coaching Inns, all have their part to play in revealing the history of this picturesque Market (Friday) Town. Over 40,000 acres of Yorkshire was given to the French Baron Walter l’Espec, who fought alongside William the Conqueror, as a reward for his services during William’s conquering reign. l’Espec decided to build his Castle in Helmsley, the ruins of which are still visible today, and it was l’Espec who invited the Cistercian monks to build a settlement on his land and after some investigation of suitable sites Rievaulx Abbey was born (actually one of the first B&B’s in the region). A classic example of Gothic architecture, even in its now ruined state, it has inspired a host of artists including Turner. 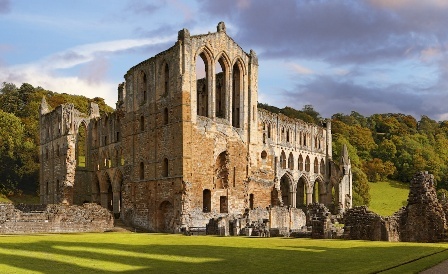 Monks from Rievaulx left this settlement and in 1177 Byland Abbey was established which was much larger and eventually much more important than Rievaulx. The 17th century witnessed the surrender of Helmsley Castle after a three month siege by the Parliamentary forces. Using the then new ‘dynamite’ the Castle was nearly all destroyed. However, it remains one of the finest examples of the double moat defensive earthworks around any castle to this day. The 18th century brought a rather grander scale to things and Castle Howard and Duncombe Park in Helmsley were built. Restored in the late 1980’s by the late Lord Feversham with help from Lady Feversham, Duncombe Park is renowned for its landscape gardens and its very old hardwood trees of which there are very few left in the whole of Europe (you ask Ted Green!). It also lays claim to having the tallest tree in Great Britain. All can be revealed when you visit. Castle Howard near Helmsley where the original Brideshead Revisited and the second version was filmed.